to manage rising health costs. Simply put, DIAL Insights is a complete platform that helps health brokers introduce lower cost plans to their clients, positively transition employees to these plans to help them start saving for health costs in retirement. We do this through a comprehensive lifecycle that allows brokers to visualize existing employee benefits, model alternative plan options, and evaluate the cost impact on both the employer as well as their employees. Taking it a step further, DIAL includes a full fledged communications program and interactive employee decision support tools to ensure employees are enrolling in the plan that best meets their health care needs. This reduces their annual health spend and creates a shared incentive for making smarter health care decisions throughout the year. 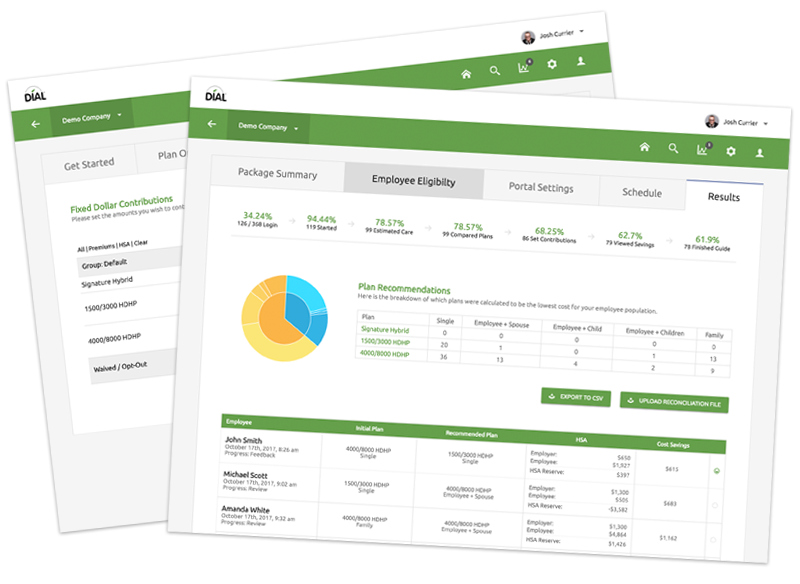 Once this is completed, DIAL can analyze the cost impact employee migration had on desired enrollment outcomes giving you the power to craft compelling benefits strategies for your clients. Demonstrate how changes to plan options and contributions can help reduce health costs. Our modeling tools allow you import your existing enrollment and see how different benefit contributions will affect total health care spending. You can also leverage past claims to estimate future employee out-of-pocket costs under various plan design scenarios. Run in-depth analyses to show how these changes will impact employees. 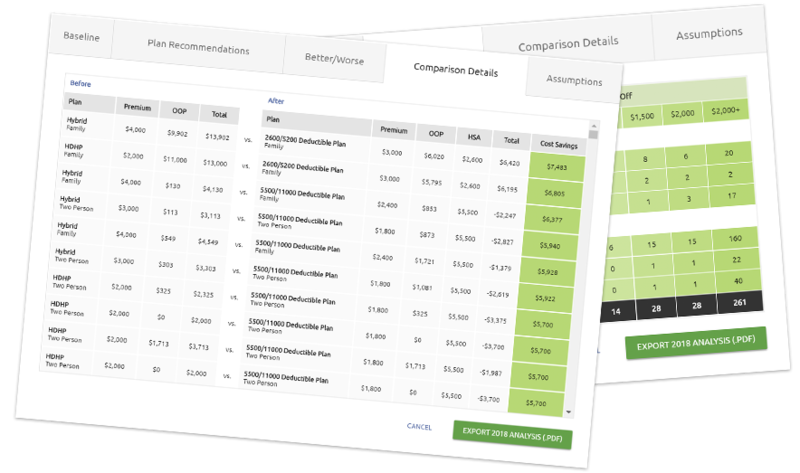 You can estimate "best plan" scenarios under a range of contribution levels and see how much employees could be better or worse off under new plan options. These reports help employers allocate dollars in a way that maximizes employee benefits. Effectively communicate these benefit options to your employer groups through easy to understand reports; complete in-depth analyses and complementary visuals. When it is time for open enrollment, this year's benefits can be communicated to employees through our fully integrated employee engagement tools. Automated outbound messaging helps increase participation rates during open enrollment and familiarizes employees with the tools and resources available to them throughout the year. Get employees in the right health plan for their needs, provide contribution recommendations for their tax-advantaged accounts, educate them on both the benefits of saving, and show how they can spend less on the health care they receive. Employees receive on-demand access to easy to understand concepts, integrated price transparency tools, and other helpful resources. In-depth analytics will show in real-time how employees are utilizing the platform, allowing you to provide valuable insight to you clients. 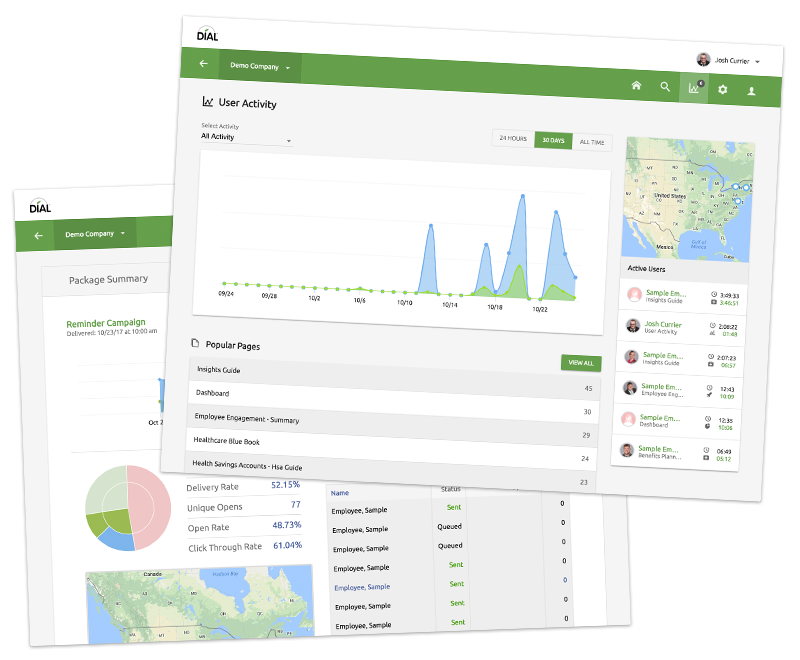 This includes campaign reports, usage statistics, and real-time feedback of benefit and contribution recommendations. 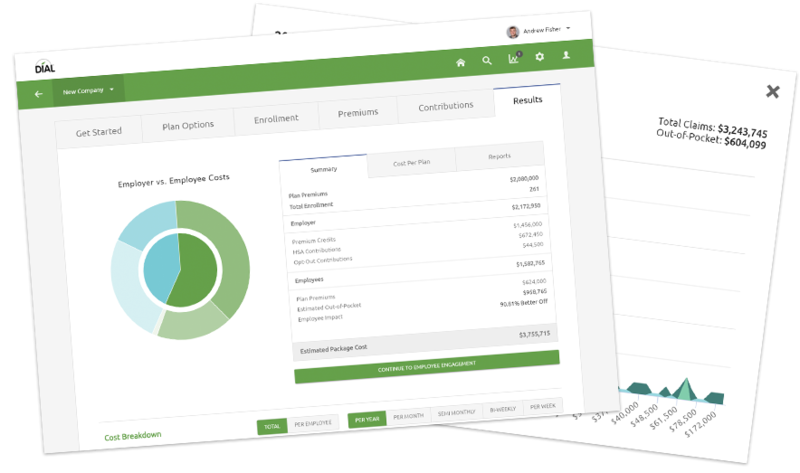 The platform provides a before & after enrollment picture of an employee population to demonstrate employer cost savings due to plan migration. It also provides year-over-year reporting for employers to track their annual benefits costs. 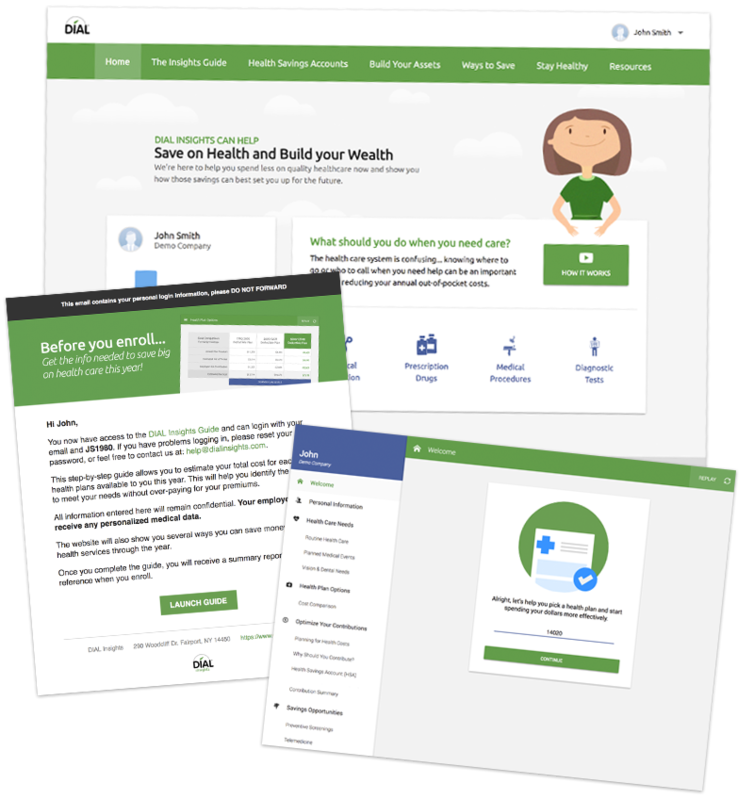 All together, DIAL Insights provides everything you need to help reduce health costs for your clients while providing valuable tools and resources to help you gain an advantage over your competitors. See how you can help your employers stabilize their costs.